Work is underway on a major road improvement scheme to reduce congestion and open up sites for development in Rotherham. £3.4m was secured last year from the government's £190m Local Pinch Point Fund to convert Pool Green roundabout (Liquid roundabout) on the edge of the town centre into signalised crossroads. The junction of A630 Centenary Way and Main Street currently experiences significant congestion and the council has previously investigated options to improve the capacity of the junction in order to improve journey time reliability and reduce delay. 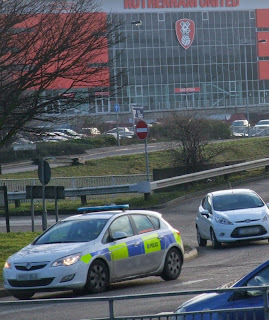 With £500k of funding from Local Transport Plan (LTP) and £1m of capital funding from the council, the scheme would also remove the barriers currently restricting the development at important sites such as the New York Stadium, the Guest & Chrimes site, Forge Island, Liquid nightclub and the wider town centre. The scheme will take nine months to complete, during which a traffic management scheme will be put in place that will allow traffic to travel in both directions along Centenary Way - but on only one lane in each direction. Traffic will also be allowed to turn off Centenary Way into both Masbrough and Main Streets. However, drivers are being warned there will be no access onto Centenary Way from both Masbrough and Main Streets and there will be no access across the junction. The improvements are also expected to have a significant impact on unlocking Rotherham's "urban extension" at Bassingthorpe Farm where the council hopes that 2,400 new residential homes and 11 hectares of employment land will be located. Development plots on the west side of the junction would also be created, which would be in the Council's ownership, and offer a future capital receipt, which initial views suggest could be worth up to £600k. 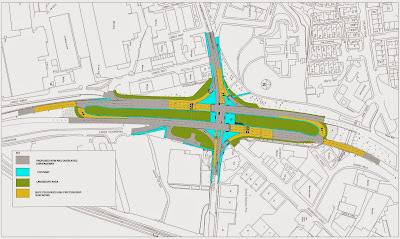 The scheme had to be redesigned after traffic surveys revealed a significant increase in flow at the junction since the previous surveys in 2010, which were used to develop the original design for the Pinch Point Scheme. The scheme involves the widening of the busy Centenary Way to three lanes as it approaches the new junction. However, to keep the traffic flowing, vehicles wishing to turn right from Centenary Way towards either Masbrough or the town centre will now need to go straight ahead at the crossroads, use the signal controlled U-Turn facilities within the wide central reservation to come back on themselves, and then turn left at the crossroads. The right turn from Masbrough Street onto Centenary Way has been retained. Eurovia Contracting UK secured the £4m contract to carry out the work which was due to be completed by March 2015. Waste of money,why not just put traffic on roundabout.Traffic lights work on St. Annes and aldwarke lane (Asda) roundabout so why not here? Traffic lights would be a disaster here. March has gone when is this going to be completed? Pedestrian crossing,traffic lights on a crossroads and a u turn facility to stop traffic flow ,200 metres from a round about. how is this going to improve traffic flow through town. It's almost complete , but looks to be a potential disaster. now this is complete it works seemlessly. traffic flow plannig at its best!